In Las Vegas, since we’re located in Mountain Standard Time, game day commences pretty early in the day. That’s why The Still opens at 9am on game days, and serves a special breakfast menu from 9-11am! Sure, you could wake up, pour yourself a bowl of cereal, and settle in for the big game. But where’s the fun in that? The big game is more fun with friends. But who feels like hosting that early in the morning? Let The Still be your early game day headquarters. We’ve got the perfect game day setting for you and all your friends! Our cavernous 8,000 square foot atmosphere is basically pure man cave bliss (women welcome too! ), featuring ample and comfortable seating and plenty of big screens to enjoy the game while you feast on our creative breakfast fare. 1. Big screens everywhere! If you’re getting out of the house early to watch the game, you want to be sure you’ve got a killer view. At The Still, we have 27 big screens throughout our space, so no matter where you’re sitting, you’ll have a great view of the action while you enjoy our expertly prepared breakfast dishes. Breakfast Bowl: Our killer breakfast bowl is made with chorizo spiced sausage, hash browns, cheese, and avocado. Yum. Egg White Breakfast Bowl: The perfect healthy option. It’s made with chicken apple sausage, sauteed spinach, avocado, and tomato. 3. 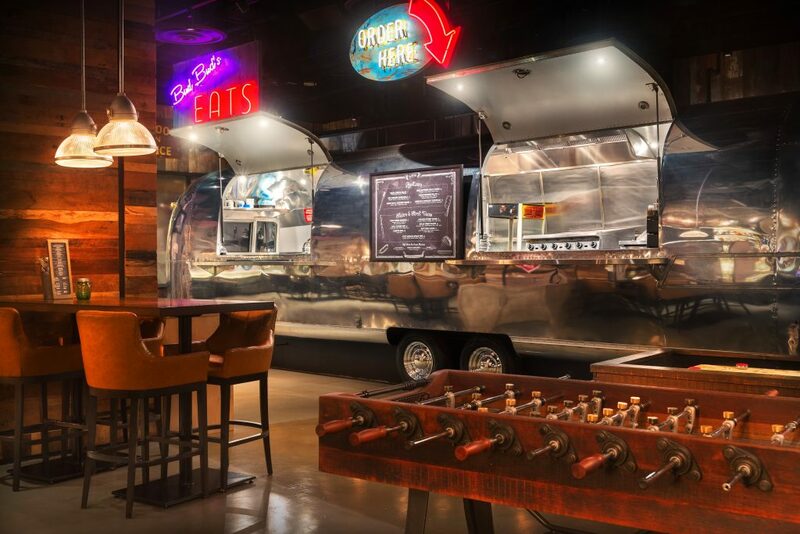 The food comes from an Airstream trailer. All of our menu items are outstanding, but the flavor isn’t the only thing about them that is extraordinary. They’re also prepared in a kitchen unlike any other you’ve seen: an Airstream Trailer! Nicknamed Bud Bud’s, the refurbished Airstream trailer that acts as a centerpiece in The Still is actually also a working kitchen. See for yourself how good food tastes when it’s prepared in this offbeat yet incredible kitchen space. Mimosa: Ours is classic, made with orange juice and Moet Chandon Sparkling Wine. Bloody Mary: It doesn’t get any better than this. Our Mary is made with Skyy Vodka and our house-made Bloody Mary mix. Bloody Maria: Same as our Bloody Mary, but with Avion Tequila instead of vodka. Poinsettia: Cranberry juice, curacao, lemon, and Moet Chandon Sparkling wine come together to make this memorable sweet-tart cocktail. Breakfast shot: Be naughty! This sweet treat is made with Jameson and Butterscotch Schnapps, and served with a sidecar of orange juice. Of course, our full cocktail menu is also available, so you have plenty more options to choose from! 5. Beer A-Plenty. The game is simply better with beer. During our game day breakfast hours (9-11am), we’re offering a bucket of 5 beers (Budweiser, Bud Light, or Michelob Ultra) for just $25! Of course, we’ve also got a full variety of other beers available on draft and by the bottle/can. Our website showcases the menu of our available options. We even have gluten-free options available! Conclusion: If you’re looking for a great spot to catch the early-morning football action, look no further than The Still. Our Las Vegas sports bar provides the ideal atmosphere for taking in the game, and our menu featuring delicious breakfast options can’t be beat. Armed with a cocktail or beer from our extensive drinks menu, you’ll be perfectly poised to cheer your team to victory. 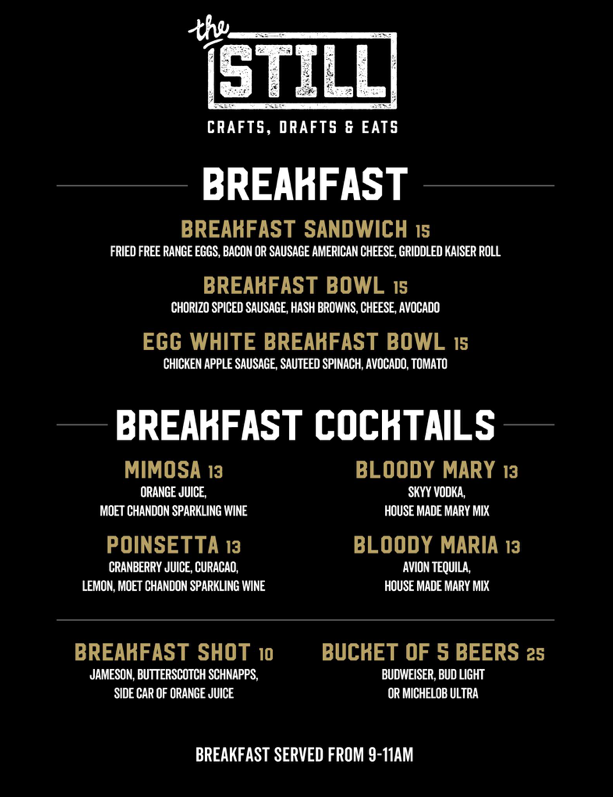 Have you tried game day breakfast at The Still?